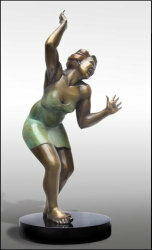 Life size Sculptures from internationally renowned artists are being sold right now as unauthorized copies worldwide! 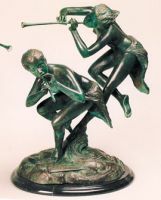 The existence, integrity, credibility, trustworthiness and livelihood of the affected bronze artists are at stake worldwide. The existence of artists is in danger! IS AUTHENTIC ART A DYING SPECIES? The travesty is that more than 30 USA companies and at least 30 European companies have sold thousands of illegal copies and these numbers are growing rapidly. This is only the tip of the iceberg. Our designs and our imagination, which are the most important possessions of an artist are being knocked off and sold as imitations world wide, as soon as we have created and published our originals. Without our consent, without our knowledge!! These companies copy ruthlessly, and they have the audacity to copy up to 25 originals of a single artist. These knockoff companies are so unscrupulous. 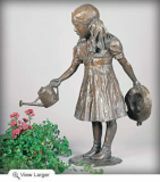 They place photos of the artist's original sculptures on their websites to sell their knockoff sculptures. BUT HENRI STUDIO IS NOT THE ARTIST, NOR HAS HE ASKED US FOR ANY LICENSE CONTRACT! WE ARE THE ARTISTS!!! The copies are signed with fake artist's names like "Leonardo Rossi", "A. Moreau", "Jim Davidson", "Moreau"
They place ads in the same major art magazines, in which the original artists also advertise. These companies give fake authenticity certificates including a picture of the knockoff "artist" and assertion that "this sculpture is created by the famous artist Leonardo Rossi"! FROM SOME OF THE ARTISTS EXIST UP TO 26 DIFFERENT DESIGNS FROM THEIR COLLECTION, ON THE WORLD MARKET ... AS KNOCK OFFS! We can prove it all! How many limits are they allowed to continue to cross? 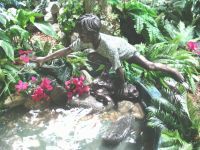 Copyrighted designs are being copied and cast in poor quality in Thailand or China and are sold world-wide in galleries, antique stores, garden centers, and even on eBay. Most of these copies are sold as bronze when they are only a junk grade of copper. The future and credibility for these original artists will be ruined if we do not take a stand. Not only for the artists but also for serious galleries, art collectors and the art market itself. That's why we as artists come together now to find a way to stop this immense damage and disrespect of Art and Artists. 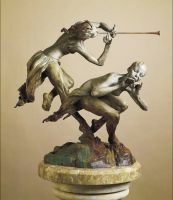 "When one considers the importance of art to a culture, the countless benefits artists have brought to document and improve their world in the realms of the physical, the mental and the spiritual, then those who deliberately weaken the arts by defrauding and preying on artists and collectors are nothing short of despicable. They are cultural criminals, and enemies of civilization. Defrauding and preying of art is a cultural crime and the thieves are enemies of any civilization." 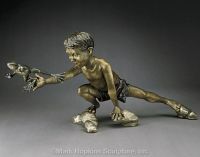 You've established a career as a sculptor, found a distinctive way to express your creativity. It's taken years of struggling, putting yourself, your family and financial security on the line, not to mention subjecting your deepest thoughts for the public critics to size up or tear down. But you rise above and move beyond all that, settling into a steady stream of creativity. You have loyal clientele, committed galleries world wide promoting your work and bottom line, you have integrity. One day you find one of your original sculpture designs being duplicated in very poor quality and offered for less than we pay our foundries. You find yourself in a quandary of taking this as the ultimate compliment or a blatant insult. Time goes by and you continue to discover numerous other attempts on your designs. Clients are noticing these duplications on the market, your galleries are hearing clients say they already own a certain piece of yours and purchased it at a greatly reduced investment, heck, your local gardening shop is selling your wares and your images are everywhere on the web. Rumours are spreading that these pieces are being cast at foundries overseas for a minimal price, and how could that be stopped. You are forced to decide between fighting for the integrity of your creations and ignoring the infringement altogether. You may question copyright protection; how it works, when does it take effect, is it too late for me to file my designs, etc. These mimics of our designs must be stopped. Entire portfolios of some artist's life-size sculptures are being manufactured in Thailand foundries, and sold in the USA, Canada, and Europe. There is a need to shut these imports down, and ultimately the foundries producing them. They feel as though they are untouchable. You are not alone in your fight and frustration. There are many other artists with the same question and consternation. Success against these companies has been had through the perseverance of artists willing to say no to these imposers and get a lawyer to approach these companies. It is disheartening for us artists, to put all our soul, heart, mind into creating our ART and other people take advantage from our imagination without even communicating to us. Nobody takes even into consideration who the artists of these sculptures are. It is a threat of our livelihood and for our survival as artists and consequently for our art. Copies cheapen creativity, cheapen ART, they are putting our credibility and integrity into question. The web-site shows you the original and the copy side by side and you can learn how to discern for yourself.